If there is one virtue that is most sought after it is happiness. However in today’s times it is also the most elusive. Unlocking the secret to being happy however is in your hands. 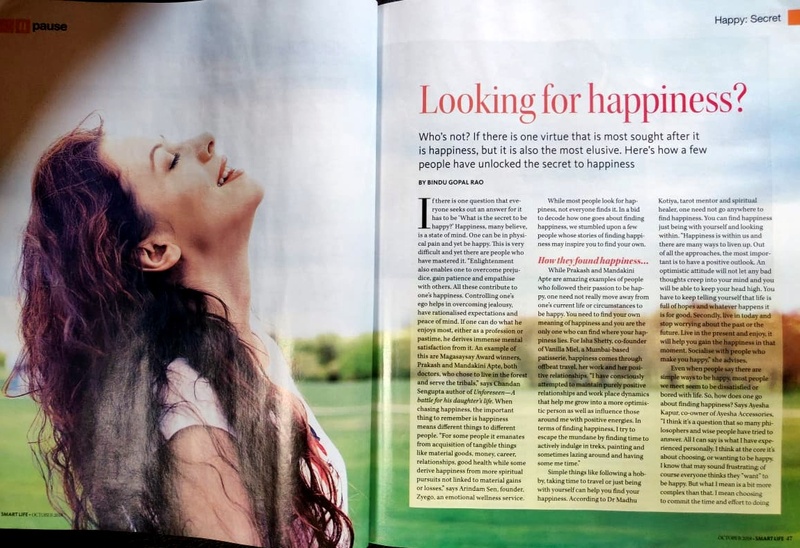 If there is one question that everyone seeks out an answer it has to be ‘What is the secret to be happy?’ Well, to put it simply there probably isn’t a single person who will say they do not want to be happy. Each one of us wants to be happy and we do not have to go anywhere to find it. Happiness is within us and there are many ways to liven up. Out of all the approaches, the most important is to have a positive outlook. An optimistic attitude will not let any bad circumstances creep into your mind and you will be able to keep your head high. You have to keep telling yourself that life is full of hopes and whatever happens it is for good. Secondly, live in today and stop worrying about the past or the future. Live in the present and enjoy, it will help you gain the happiness in that moment. Socialize with people who makes you happy,” says Dr.Madhu Kotiya, Tarot Mentor and Spiritual healer. It has been proved that we are happy when we are around those who are happy too. This also means that we should spread smiles to those in need. You feel a sense of contentment when you know that you are the reason for someone’s happiness. And sometimes listen to your heart. Circumstances play a very important role in happiness. But it is not a linear relationship. These are all variable factors. Happiness is a concept. In the last 30 or 40 years, a lot of research has been done on this topic. “In Western countries, courses are conducted on happiness. People believe that happiness increases productivity and reduces tension. However, as a doctor, I can say that good physical health is in our hand. Sincerity in the role which has been thrown at us is in our control. We have to be careful not to fall into the trap of drugs, alcohol and smoking. Recreation and meditation can be of a great help and a balance in life is important. Losing this balance can make a person unhappy,” says Dr. P D Lakdawala, Psychiatrist, Bhatia Hospital. Happiness is an overall feeling and experience which results from a positive and desirable outcome of life goals desires, actions and experiences in tune with the overall personal objectives of a person during their lifetime. “For some people it emanates from acquisition of tangible things like material goods, money, career, relationships, good health while some derive happiness from more spiritual pursuits not linked to material gains or losses. We have to set short, medium and long term life goals so that once we achieve them we have small doses of happiness and satisfaction coming our way. Linking overall and total happiness to fulfilment of large goals or milestones can be long drawn out and in case the final milestone is not achieved, leads to disappointment and despair,” avers Arindam Seen Founder, Zyego, an emotional wellness service. How many times we have seen or met two people, in the same profession, same state of life, same financial obligations. One of them seem to be complaining and the other one seems to be enjoying his life. Singer Shahid Mallya says, “for me, gratitude leads to happiness and determines our attitude. As we practice gratitude, it becomes our second nature and we become able to find the beauty in the diminutive things and appreciate all life has to offer. Expressing gratitude turns our mental focus to the positive way of life. By doing this we can fully experience the moment and learn to engage with each moment on its terms, taking things as they come. We can be way happier this way.” Happiness is generally confused with the absence of struggles and inabilities in life. For example, the son of a rich man may put in the category of generally happy on a social scale. And that’s where the confusion begins. “Happiness is the human ability to realise that everyone is equally capable of achieving it and The lack of happiness is the human inability to find it within and rather search for it among the stuff outside. We must remember that a daily wage labourer, who is finding it difficult to make his ends meet can be equally happy or unhappy as compared to a business man who is under loan of crores to start a new venture and has hundreds of families to feed,” says Abhinav Singh, author of ‘The Last Attractor of Chaos’. Learn to meditate. It is the sure-shot way of listening to your heart’s voice. Think positive always. Access the situation you are in and try to know the pitfalls and keep your eyes on what can go right! Constantly brooding over past mistakes can rob one of happiness. Let go the past is gone. Get over it and move ahead. Worrying about what the future entails also robs us of joy! Do the right thing and the future will take care of itself. The only guarantee we have for our future is good karma. So plant good seeds as you go along with it. Knowingly and deliberately work on planting good deeds good words and good thoughts. Ayesha Kapur, Co-owner, Ayesha Accessories recollects her journey to finding happiness. Writing a list for clarity is something my mother taught me a long time ago and writing down the things that make you happy and getting it done also gives you an amazing sense of achievement. Ticking them off is extremely satisfying. Routine makes me feel happy whether it is the same brand of coffee in the morning or fruits with slightly sour unsweetened yoghurt makes me feel healthy and in control. Stop making excuses and tackle the things that you know would make you happy but you have not for whatever reason. Start seeking it and make it part of your routine. Then start adding more “healthy lifestyle choices” to your routine. I was an avid reader when I was a child but slowly grew out of the habit but knew that reading was something that I really have benefited from and starting again would truly make me happier and more successful in everything I’m doing. Be aware of your diet as it can affect your mood. Do your research, but also listen to your body and how you feel. I find that meals with a large number of carbohydrates make me feel sluggish and less energetic or too much sugar makes me feel anxious. 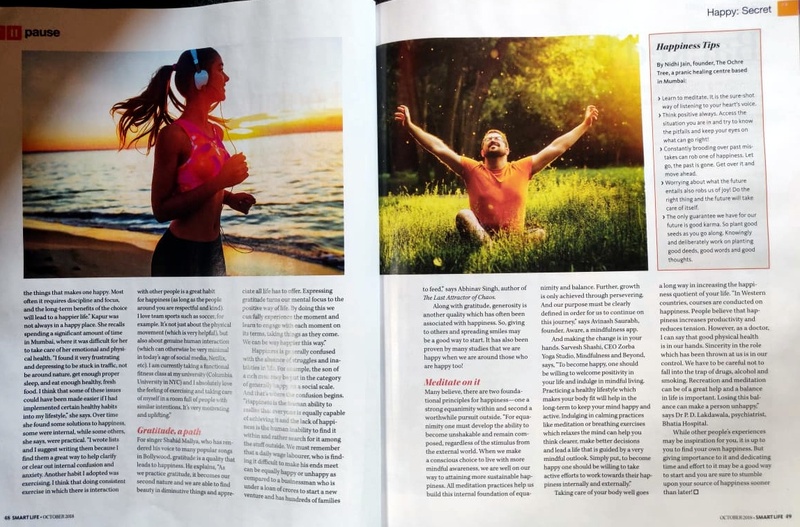 Exercise not just to get fit or look a certain way, but because starting consistent exercise can change your life, your mind, your state of being. It really does release the happy hormones. It does not matter what is the nature of your activity, essentially you are in pursuit of happiness. If you look at your own life’s experience, whenever happiness happened to you, it does not matter what was the stimulus – maybe you watched the sun rise and you became very joyful, maybe you heard some music and you became very joyful, maybe you achieved some success and you were joyful – it does not matter what was the stimulus, but whenever happiness or joy happened to you it always bubbled up from within you. It never rained upon you from somewhere else. So the very source of happiness is within you. Right now, the stimulus is outside. Now the choice is just this whether you want to keep the stimulus outside or you want to keep it inside. The source of happiness is within you but the switch for it is in somebody else’s hands. They can turn it on or turn it off. Anybody can make you happy, anybody can make you unhappy; any situation can hijack your happiness at any moment. All those people, who depend on external situations to be happy, will never know true joy in their lives. No matter what kind of a person you are, how powerful you are, even if you are a super human, you do not have absolute control over the external situation. Even if there are two people in the family, they do not have total control over the situation. You can manage the external situation only to a certain extent. But your interior can be taken into absolute control.